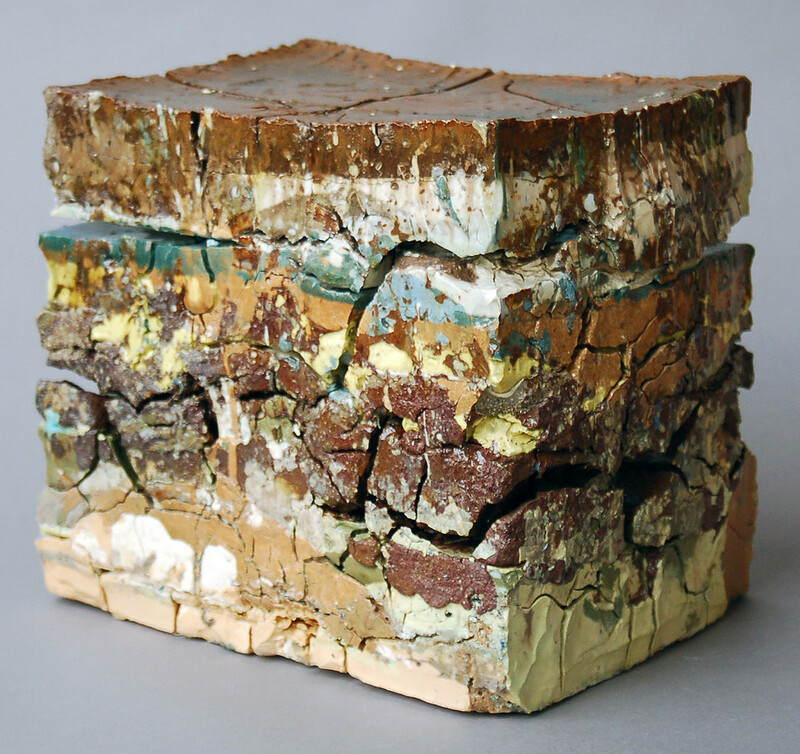 These masses of recycled clay studio waste are intriguingly obtrusive objects, yet seem like Diorama-esque, scaled down cross-sections of an anthropological dig. 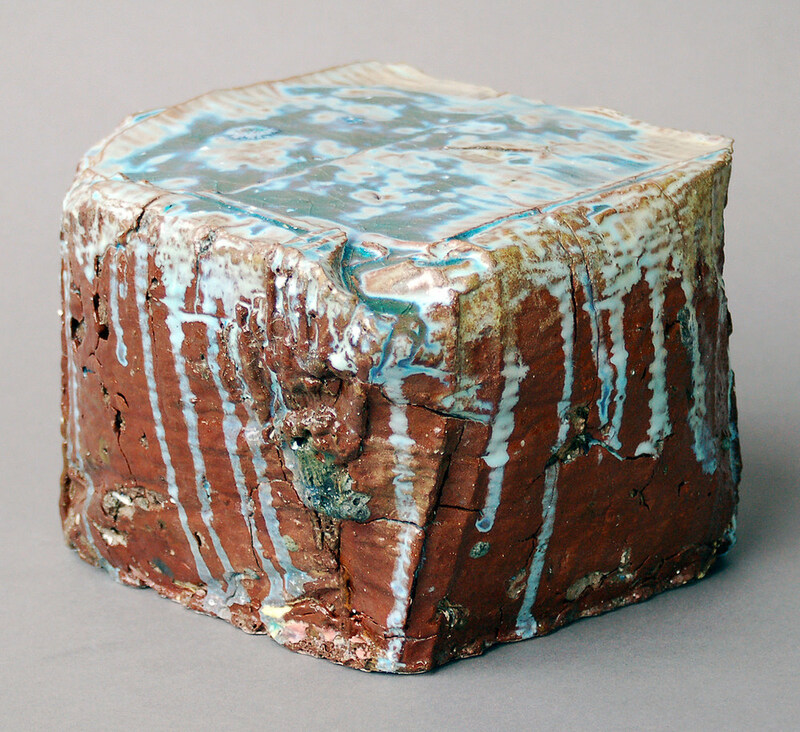 Parts of the fired glaze ooze like lava out of the subterranean layers. Each section suggests a timeline: Triassic, Paleozoic, Mesozoic. Each “Landfill” is a little slice of a geologist’s heaven. 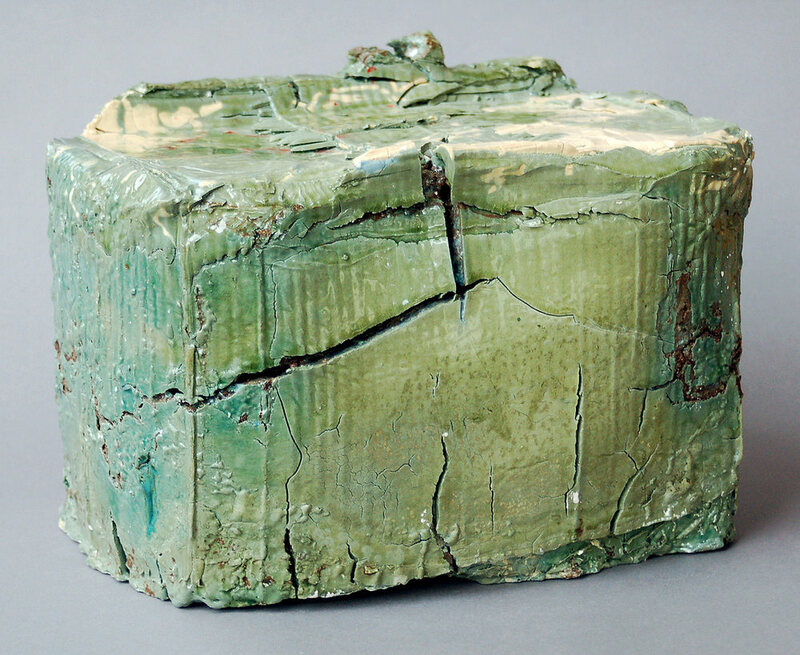 This series of work reflects my interest in the physicality and reality of land and the evidence of time and age in the layers of earth, in contrast with contemporary human relationships with land through usage, manipulation, ownership and division. 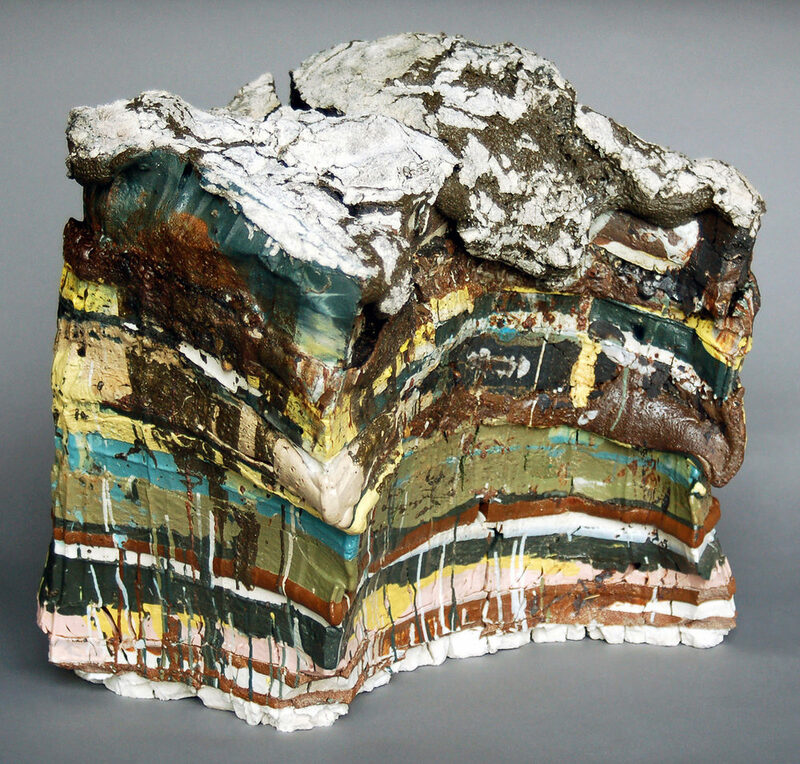 By slowly pouring layer upon layer of pre-colored casting slip into found cardboard boxes in various thicknesses, wetnesses and consistencies, and by adding recycled clay, slop clay, old glazes and leftover ceramic materials into the mix, I created a wasteland form of refuse resembling geologic layers of time. 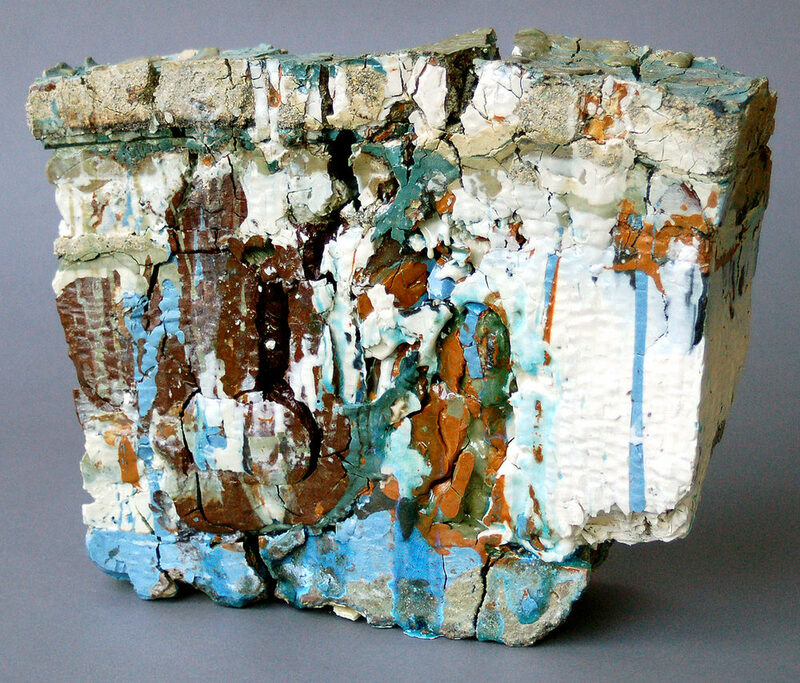 In my eyes, the forms became land and the layering of clay directly related to geology. The cardboard box became a divider of rectangular land parcels, or grids. 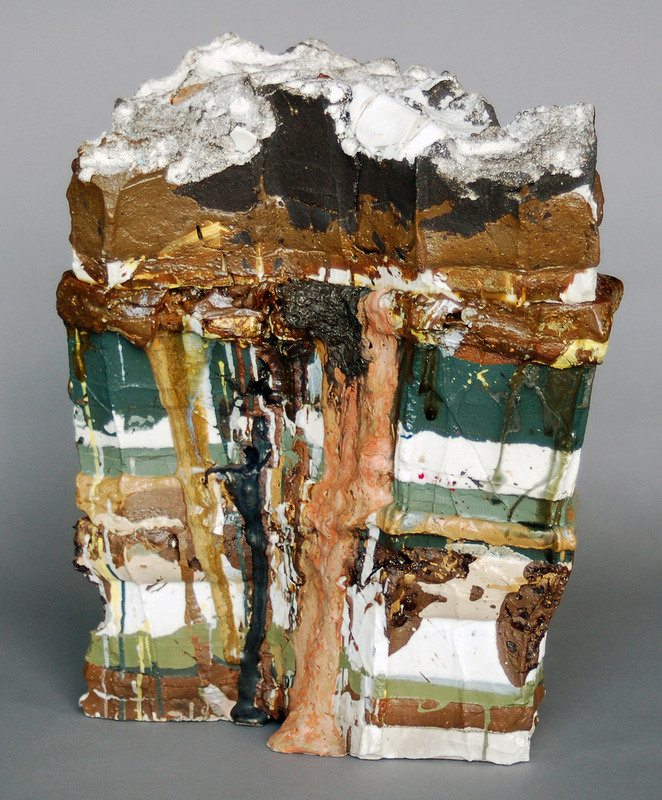 My process became that of a painter working in layers, but the images on these layers were completely lost as the Landfills grew in height. This was both exciting and disappointing, and led me to a documentation process that would eventually become a video. Time, along with directional wind from fans, created both controlled and uncontrolled shrinkage, cracking and bloating in these Landfills. Like playing nature, I found I could control elements to achieve different geologic effects. A series of prints also resulted from my process. 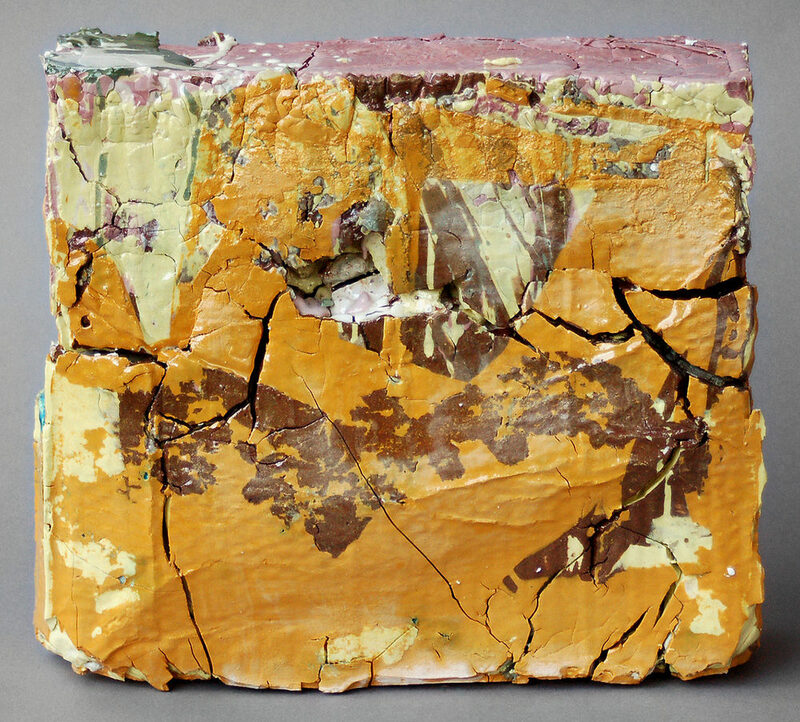 The By-Products are prints of the stains that the clay, colorants and moisture left on the cardboard boxes. 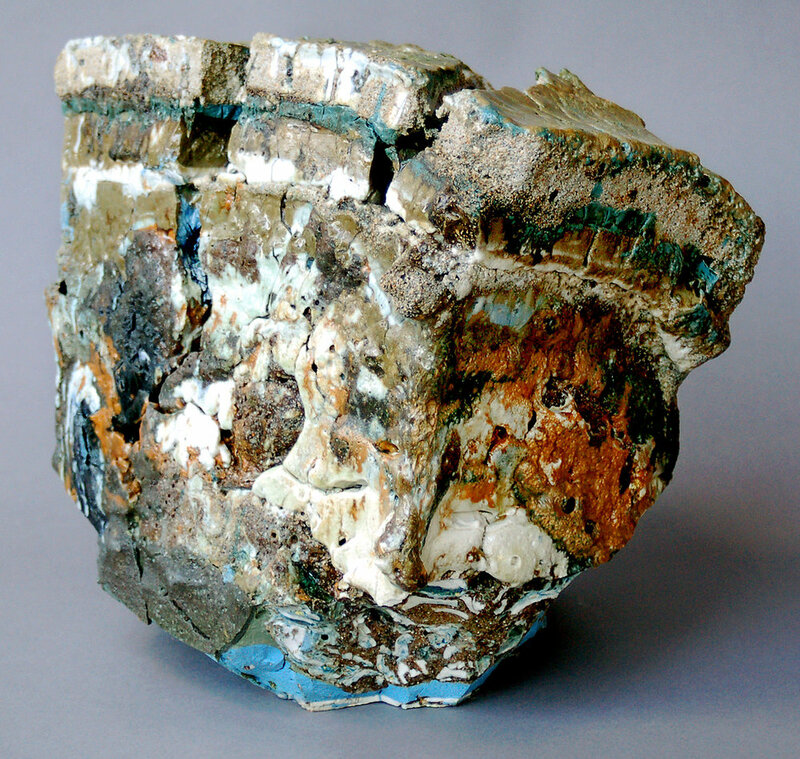 As I removed them from the forms, I found that they had soaked up a documentation of the layers, and the original unfired colors would remain long after the work was fired. 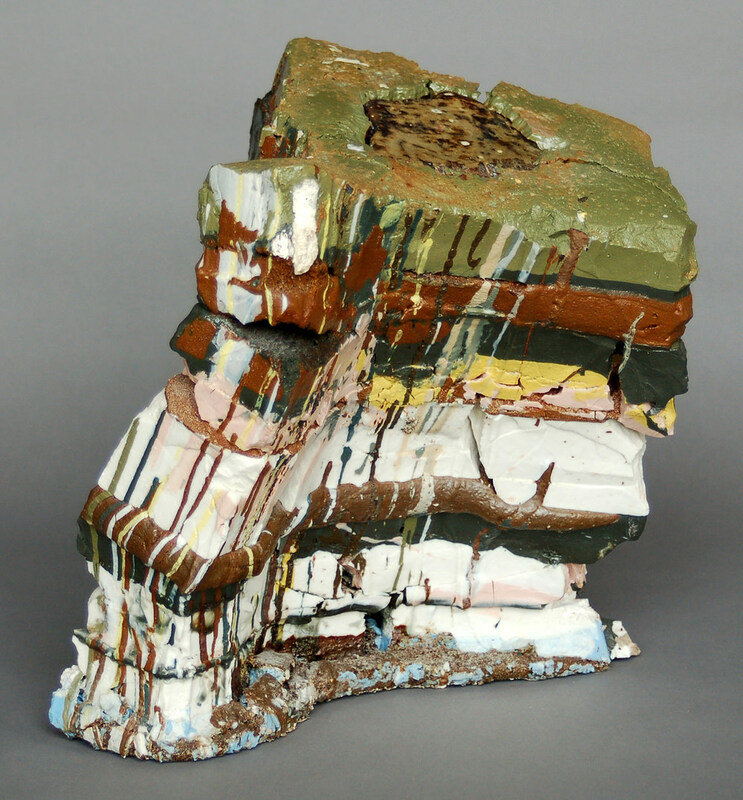 Furthermore, the stains of the layers had created an ironic impressionistic landscape on the molds that had contained the Landfills. This entire body of work was displayed in an installation entitled Down to Earth in May of 2008. 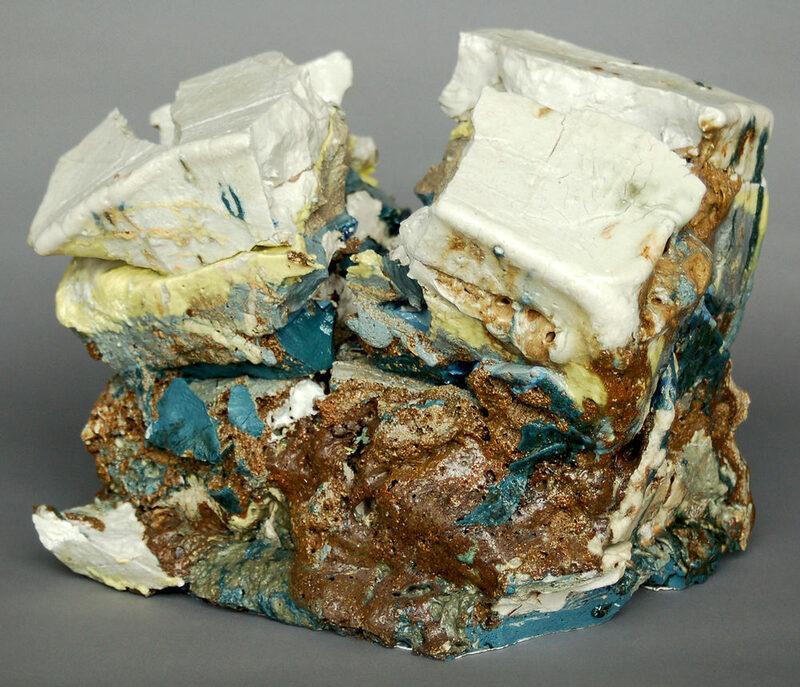 Fifty Landfills were shown in their unfired, raw material state on steel shelves. Fifty By-Product cardboard prints cascaded down a fifteen-foot wall nearby, and the video Time Beneath documenting the innumerable layers that created the Landfills was projected through the shelves of work onto the opposite wall.